We, Higee Machinery (Shanghai) Co., Ltd are a professional labeling machine manufacturer with more than 10 years' experience. On the June 20th, 2017, we received the inquiry from Myanmar client Mr. Jeff. He was looking forautomatic two sides labeling machine for flat, oval and square bottles. The machine use for the daily chemicals like shampoo, body cream etc. Then we discussed the proposal from specification to delivery time and solve more technical problem. Client was very critical for all the details, we all give positive, professional and quick feedback, finally we became a partner. After the labeling machine arrived and working for some time, Mr. Jeff needs to add a new function on the machine, he want the labeling machine also can do label application for round bottles. To be honest, it’s hard to assemble the new components. 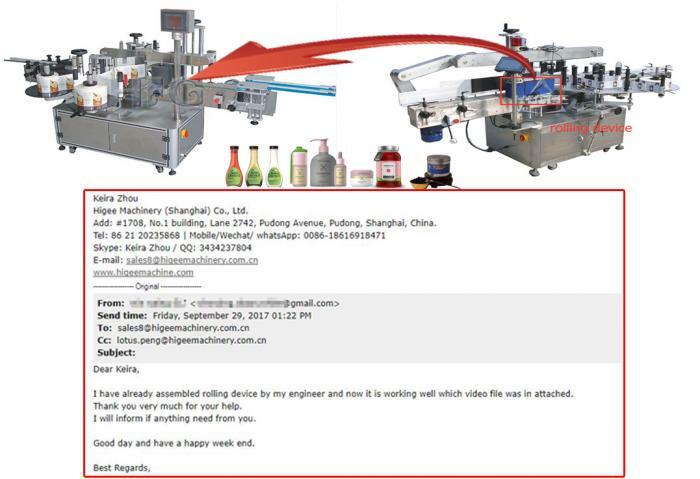 But we sent the relevant device (rolling parts for round bottles) and other parts for clients and also give guidance how to assemble. We send the picture and video to introduce the assemble process via e-mail. Finally, we settled the problem face to face by WhatsApp. On the September 29th, we received his email for thanks from client. Our professional technique and good service makes even critical customers trust us and pleased to be served well. If you need labeling machine, pls contact us freely. We’ll be your good choice for all kinds of labeling solution. Believe us, we’ll be your good partner. Higee Machinery (Shanghai) Co., Ltd）Nosotros somos una manufactura de máquinas de etiquetado profesional con 10 años de experiencia.El 20 de junio, recibimos su consulta de Myanmar cliente Jeff. Debido a la forma de las botellas, Señor Jeff necesita instalar una funcion nueva en la máquina,pero es muy difícil emsamblar los componentes nuevos,nosotrsos nos comunicamos con los ingenierons muchas veces,y despues comfirmamos enviar el dispositivo rodante y otras partes a señor Jeff,al mismo tiempo, nosotros enviamos las fotos y el video para instalar las partes por el cliente, al final nosotros ingeniero usa el video de whatsapp para resolver las preguntas . 29/9/2017,nosotros recibimos un correo por agradecer,por favor mire un anexo. Nuestras técnica profecional y buen servicio siemple hace que los clientes confien. Si usted necesita mquina de etiquetas, pongase en contacto con nosotros.